IPL 2019: CSK cements their place at the top of the table with 14 points. IPL 2019: Old is Gold! Yes, Suresh Raina came good against KKR as CSK won the crucial encounter by five wickets at Eden Gardens. It was the southpaw’s 58 off 42 balls and his 36th fifty that helped CSK over the line. Raina may not be in the contention for a World Cup spot which is supposed to be announced by BCCI on Monday (April 15), but fans want BCCI to reconsider Raina for No 4 spot. Raina’s breathtaking innings was laced with seven fours and a six. Raina also surpassed David Warner t score more runs against KKR in IPL. He went past Warner’s tally of 762 runs. 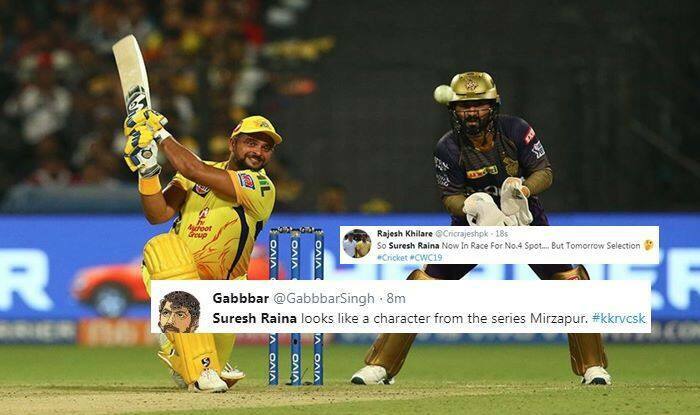 Here is how Twitter hailed the veteran as he won the match for CSK. Earlier in the day, Imran Tahir snared four wickets as Chennai Super Kings (CSK) restricted Kolkata Knight Riders (KKR) to 161/8 in 20 overs in their Indian Premier League (IPL) return leg fixture at the Eden Gardens.